While I was making dinner, I heard children before my house. I found it funny that even without looking out, you can tell children's voices from adult's voices, and even more amazing that Lao children have a certain quality of their voices which is different from European kids. I listened for a while, trying to determine the difference. Kid's voices can be more shrill, definitely the tones are higher. Their words sound like peeps, like little chicks. It's a wonderful music. 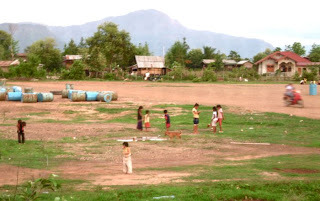 The picture above is of the kids playing along the old air field. They come from the houses at the edge of the field and they wander around in small groups, usually with an older kid watching over them. They look for small animals and make up games in their own universe. There's a blog post called Wonderment , about how children are so amazed by seeing the world anew and how the world would be a better place if adults could see things as fresh as children can. So even though the playground is a lot, I also heard the exclamation points of surprise and wonder as the children called to each other. "I found a flower." "Look at this stone!"